Reason: A tampering issue has occurred where blisters of another medication have been found in one batch (CJ860) of Valpam 5 tablets. Management of anxiety disorders or for the short-term relief of the symptoms of anxiety. Anxiety or tension associated with the stress of everyday life usually does not require treatment with an anxiolytic. In acute alcohol withdrawal, diazepam may be useful in the symptomatic relief of acute agitation, tremor, impending or acute delirium tremens and hallucinosis. Diazepam is a useful adjunct for the relief of reflex muscle spasm due to local trauma (injury, inflammation) to muscles, bones and joints. It can also be used to combat spasticity due to upper motor neuron lesions such as cerebral palsy and paraplegia, as well as in athetosis and stiff-man syndrome. Round, flat, bevel edged, white to off-white tablet, engraved with 'DZ' break line '2' on one side and plain on the other side. 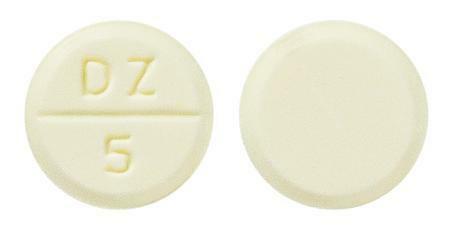 Round, flat, bevel edged, light yellow tablet, engraved with 'DZ' break line '5' on one side and plain on the other side.